1/2 Flooded truck A flooded truck shows how serious floods can be. 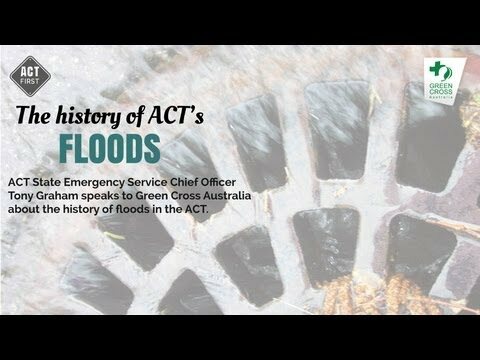 1/2 The history of floods Tony Graham talks about the history of floods in the ACT. 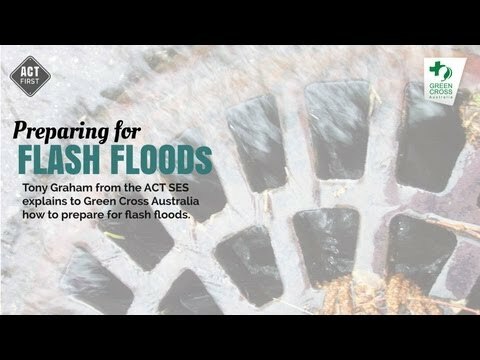 Over recent decades measures have been taken to protect Canberra from historical flooding impacts, but torrential rainfall can happen anywhere in the ACT. On January 26 1071, up to to 100 mm was recorded in one hour by private rain gauges in the suburb of Farrer and Torrens. A general and temporary condition of partial or complete inundation of normally dry land areas from overflow of inland or tidal waters from the unusual and rapid accumulation or runoff of surface waters from any source. In November 2011, the Australian Government introduced a standard definition of flood for certain insurance policies. The announcement was part of the Government’s response to the recommendations in the Natural Disaster Insurance Review report. Flooding occurs most commonly from heavy rainfall when natural watercourses do not have the capacity to convey excess water. However, floods are not always caused by heavy rainfall. They can result from other phenomena, particularly in coastal areas where inundation can be caused by a storm surge associated with a tropical cyclone, a tsunami or a high tide coinciding with higher than normal river levels. Dam failure, triggered for example by an earthquake, will result in flooding of the downstream area, even in dry weather conditions. Riverine flooding occurs in relatively low-lying areas adjacent to streams and rivers. In the extensive flat inland regions of Australia, floods may spread over thousands of square kilometres and last several weeks, with flood warnings sometimes issued months in advance. In the mountain and coastal regions of Australia flooding can happen rapidly with a warning of only a few hours in some cases. The Great Dividing Range which extends along the length of eastern Australia provides a natural separation between the longer and slower westerly flowing rivers and the shorter, faster easterly flowing coastal rivers. In some cases natural blockages at river mouths, including storm surge and high tides, may also cause localised flooding of estuaries and coastal lake systems. The ACT Government has been committed to a high level of planning since its inception to guide new development and redevelopment in Canberra. Stormwater planning has been an important aspect of flood risk planning in the ACT and will continue to frame future urban development of new growth areas in Canberra. Stormwater management addresses environmental impacts as well as community and property safety. In the early 1970’s the ACT Government adopted the 1% AEP “Annual Exceedance Probability” threshold in relation to flood protection planning. A major factor was the loss of seven lives during the 1971 Woden Valley flood, which had an AEP of about 1% according to the NSW Floodplain Development Manual. This has guided development of an extensive Stormwater Network and other investments in flood mitigation infrastructure and policies. Roads ACT maintains the urban stormwater network which comprises of sumps, stormwater pipes, stormwater channels, water quality pond embankments, cut off drains, retarding basins Gross Pollutant Traps, dams and weirs. optimising the land available for urbanisation. As stormwater runoff flows over the landscape it collects pollutants. Importantly, the stormwater network in the ACT incorporates various pollution control systems intended to remove pollution from water before it flows into the Murrumbidgee River. Indirectly, the stormwater network provides a number of other benefits to the residents of the ACT. These include enhancing the urban landscape and providing recreational opportunities through the use of lakes and ponds.